Caution: This post contains photos of my feet! I have a terrible admission to make: I bought Crocs. In fact, I bought two pairs of Crocs. I know I'm an awful, awful blogger! In my defense, I was on holiday, my feet were aching and everybody seemed to be wearing Crocs. I would stand in the ride queues and stare jealously at their comfy feet as mine cried out from their Primark ballet flats. One day, in the Animal Kingdom gift shop, I made the mistake of trying on a pair of Crocs flip flops. Oh my sweet lord, it was the most amazing thing. It was like stepping into a cloud! Unfortunately, they were $60 and I figured that was just too much to spend on a pair of flip flops. The next day, we visited the mall, and Laura pointed out a Crocs shop. We made the best decision of our short lives and decided to pay a visit. After quite a while, trying on near enough every pair in the shop, I decided to buy the black Kadee shoes. I figured they were subtle enough to not look like Crocs, and versatile enough to wear with anything. Plus, they would be ideal for work. Let me tell you: They are the comfiest shoes I have ever worn in my life. I'm pretty certain the sole is padded with feathers and it has little nodules to give your feet a little massage with every step. The downside? They're made of rubber. Not only does this cause several static electric shocks a day but, as you might imagine, they are very hot and sweaty. Not so bad in England, but in Florida, my feet were sliding around all over the place. My poor feet also became very swollen and, as a result, rubbed horrendously against the solid, unwielding rubber heel. The solution? Buy the flip flops! Oh, my glorious, sweet, Disney x Crocs flip flops! The greatest joy my feet have ever experienced! I don't even wear flip flops but take the feather-filled sole of my Kadee shoes, with the added bonus of no blister-inducing heels and you have The Best Shoes In The World. Seriously. Even the toe post is made of fabric so it doesn't rub or chafe. I should probably state at this point that this post is in no way sponsored by Crocs. I am just so overwhelmed with my love for these shoes that I think everybody should rethink the way they look at these poor, misunderstood things of beauty. Open your minds! Embrace the cushioning! Your feet will thank you for the rest of your life. FINALLY, someone else who appreciates the Crocs flip flops! A woman at work recommended me them before I went to Florida and I bought a plain black & white stripy pair and they were the only shoes I wore in the two weeks - my feet never hurt once! Wish I'd seen the Disney ones though, I would have been all over them! 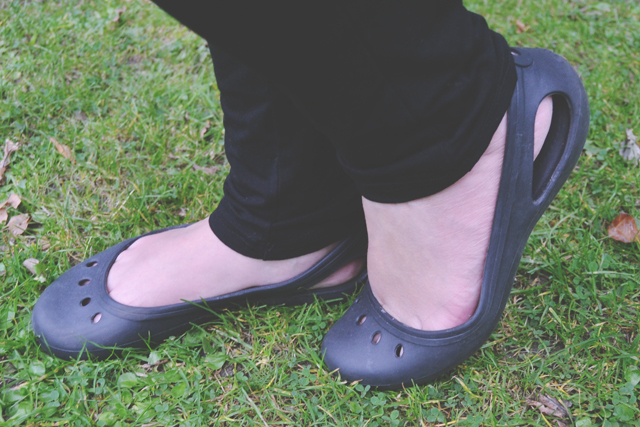 crocs shoes are THE most comfortable shoes ever, I had a pair and I absolutely wore them to death!! They aren't at all ugly either, which is a bonus! Um... Don't call me I'll call you. They are really comfortable, but still have got the confidence to wear them in public. I AM SO GETTING THE DISNEY CROCS WHEN I'M THERE!